Searching for Bonobo in Congo » Is it Possible to Save Congo’s Parrots? « Justice or Vengeance in the Heart of Africa? African Grey Parrots descend to the ground at the Aikongo forest clearing, northwest of the Lomami Park. Mustapha, member of our team, with African Grey chicks the day after their capture. DRCongo is the largest exporter of African Grey Parrots. It is likely also the country with the largest remaining wild populations. Currently, under CITES provisions African Greys are Appendix Two species, which limits legal DRCongo exports to 5000 individuals per year. 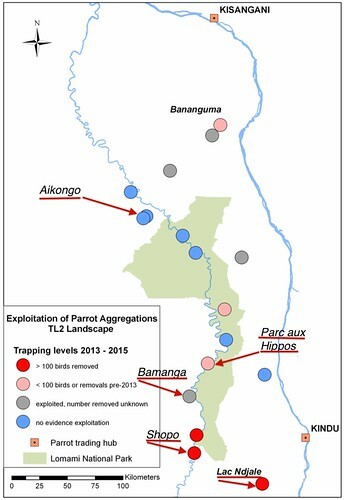 Based on recent Lukuru research (summarized here, and published here, we know that this quota is massively exceeded; expansion of trapping operations in Maniema and Orientale provinces is driving parrot declines. With little local incentive for sustainable exploitation, in all likelihood, parrot numbers will continue to drop until current trapping epicenters are seriously (irreparably?) depleted. So how do we halt the precipitous decline? 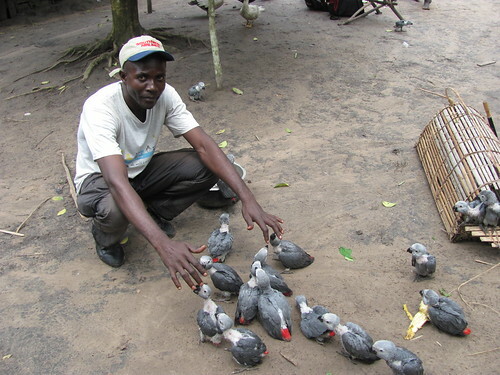 Lac Ndjale is different from most parrot trapping sites around the Lomami Park because it is a nesting site and trappers collect chicks directly from the nest. Here, we set a camera trap 20 meters up the tree and just beneath an African Grey nest site. Secondly, we must have cooperation from the local (Provincial) administrations to both enforce existing government regulations, and even create stricter capture and trade controls. Currently, African Grey Parrots are not on the radar of local administrations. There is almost no application of Provincial regulations. A functional Provincial system will be essential to enforce both local and international parrot capture and trade restrictions. Lambert, from the Provincial Environment Ministry, talks to villagers near Lac Ndjale about African Grey Parrot regulations. 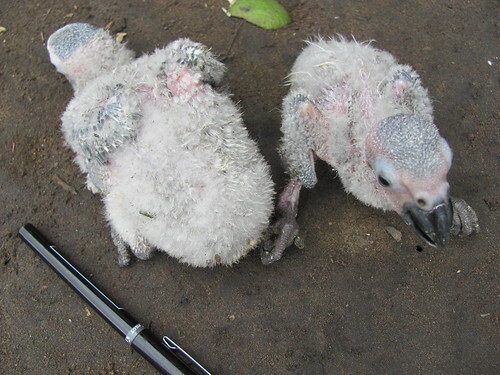 Although the TL2 project collaborates closely with provincial environmental ministries to enforce a number of important laws concerning the park and bushmeat exploitation, parrot trade and parrot monitoring are new. I took an appointed ministry official, along on a research trip to an important African Grey nesting site, Lac Ndjale, about 60km south of Kindu. At the last-minute a minor official turned up, Lambert. 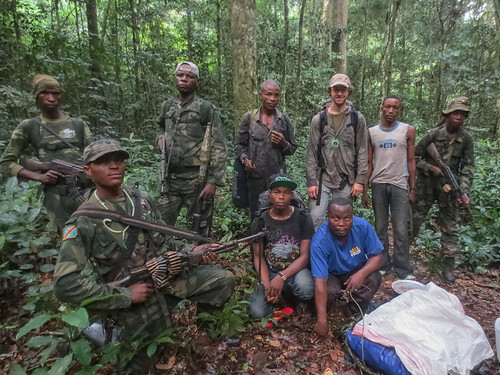 Our five-day trip confirmed Lac Ndjale to be an extremely important nesting site for parrots; it is also the largest trapping operation known to TL2: locals report over 3000 nestlings are collected each year during the prime trapping season January-March. African Grey Parrots captured too young and close to death. It was soon obvious that Lambert could communicate little about existing African Grey Parrot regulations; he did not even know that that the legal trapping season only runs from February through July. It is not only Lambert, the TL2 project recognizes that provincial authorities have an urgent need for parrot information and a priority setting session. 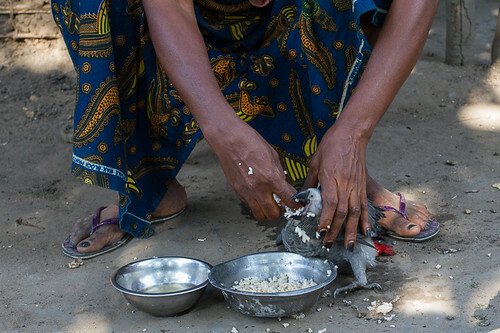 The sister of a Lac Ndjale parrot trapper force feeds rice to chicks. The trapper reported chick mortality at greater than 50% during the prime capture season, January to March. 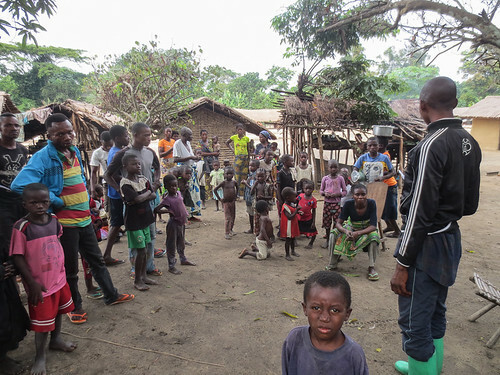 Training is not all that is needed; in order to understand the impact of the trade, to know what is being lost, TL2 must, itself, learn as much as possible about parrot populations in and around the Lomami National Park. 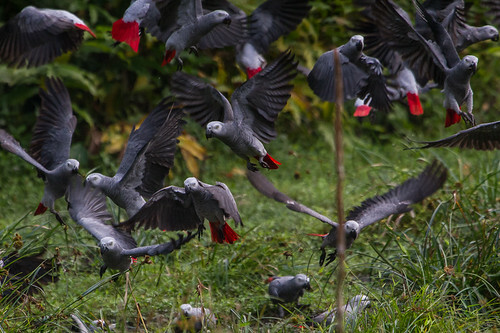 Besides nesting sites, like Lac Ndjale, African Greys congregate in forest clearings: these congregations, or gatherings, undoubtedly play an important role in their social behavior, yet the dynamics of these gatherings remain mostly unknown. Two trappers at one of the Shopo sites climb with glue sticks. These are fastened high in a tree with a bound living decoy bird whose distress calls bring in other parrots. What makes a clearing “good” for parrots? Why do some clearings have parrots visiting every day, other clearings seem to be visited seasonally, and some clearings have no parrots? Where do parrots go after they disperse from the clearings? (Protection offered by the Lomami Park is only effective if the parrots remain inside the park.) Critically, these clearing agglomerations make parrots vulnerable to capture. Because of this, TL2 must find, map and monitor clearings visited by parrots. Map showing what is now known about African Grey Parrot capture sites in and around the Lomami Park. Those mentioned in this article are labeled. Most of the clearings around the Lomami Park have had some level of African Grey trapping. The Aikongo clearing is one of the most important parrot sites known to TL2: parrots visit the clearing daily. As of May 2015 there was no sign that parrots had been trapped there. This was largest group of parrots we observed at Aikongo in late June. It is likely that many of these individuals have already been caught. My team arrived at Aikongo in late June to find a large holding cage, newly built. Our guide Zacharie told us that two trappers from the village Elengalale, about 25km away, had spent about a week trapping at Aikongo, and only left because they heard my team was soon coming. 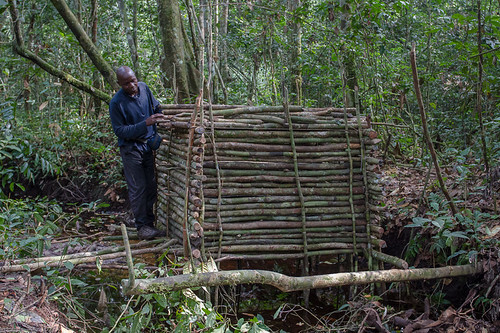 Gilbert Paluku, a member of my team, examines the parrot holding cage built by trappers at Aikongo a couple of weeks earlier. 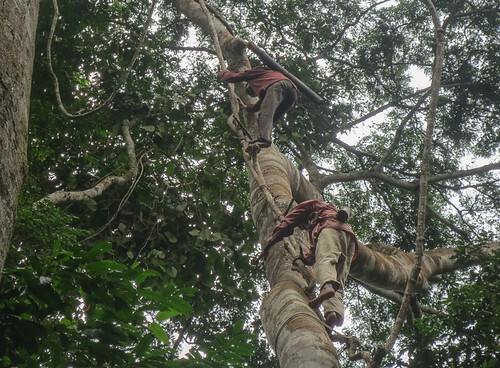 Unconfirmed reports suggest they captured about 40 parrots during that week, and the effect on the Aikongo congregation was noticeable: the highest AGP count during this trip was 79 individuals, compared to over 120 counted at the same site in 2013. We were escorted by military to visit several clearings in Yawende (including Aikongo) northwest of the Lomami Park. If the trappers returned to Aikongo after my team left, which is very likely, the Aikongo parrots will already be significantly depleted, possibly approaching complete extirpation. These key aggregations must receive a higher level of protection through monitoring and law enforcement if we are to save them. A field report at the end of June from one of the TL2 staff, Matthieu Mirambo, shows how rapidly African Grey Parrot trapping is expanding around the park. 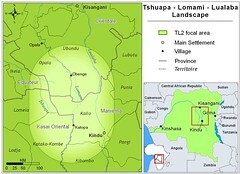 His dugout on the Lomami stopped at a fishing camp known as Parc aux Hippos, on the edge of the park (see map above). They found a trapper who in just a single day had collected 25 parrots, using three living decoys. He had absolutely no permits. The clearing had not been trapped in years. 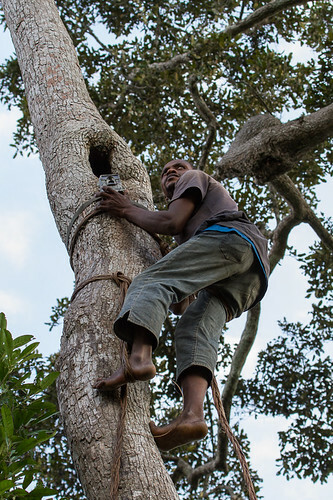 The trapper admitted that he moved north because the Bamanga clearing was trapped out and the Tshopo clearing had fewer and fewer parrots to capture. There is urgency for the TL2 project to increase protection on the ground and for the international community to close down legal African Grey exports. 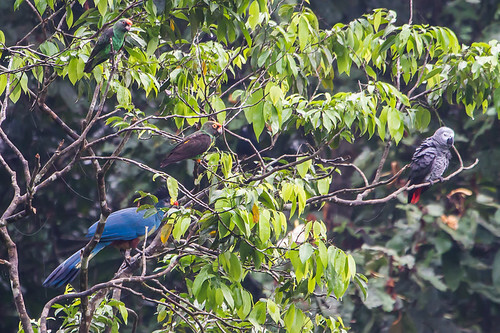 An African Grey Parrot, two of the less common Red-fronted Parrots and a Great Blue Turaco all gather in a single tree on the edge of the Aikongo clearing. For more information about Andrew’s recent parrot study see his blog. This entry was written by Terese Hart, posted on 2015-08-11 at 3:48 pm, filed under Law and Order, Natural History of TL2. Bookmark the permalink. Follow any comments here with the RSS feed for this post. Trackbacks are closed, but you can post a comment.